MEMBERS OF THE POLICIES COMMITTEE PRESENT the comprehensive, one-stop document on Union policies. 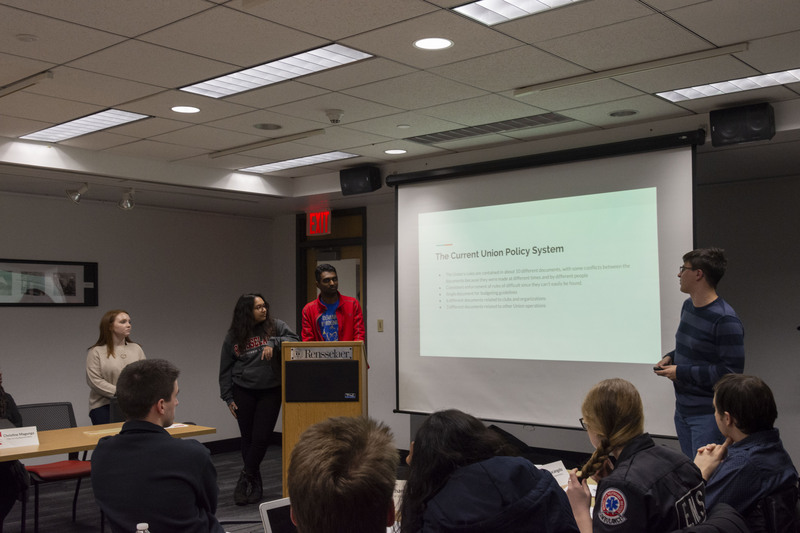 The Executive Board approved an internal policy overhaul, reallocation of funds for student performers and a fist installation at the Black Students’ Alliance annual fashion show, and new jackets for RPI Ambulance on January 24. Clubs are classified as “Recognized, unfunded clubs,” “Recognized, funded clubs,” “Recognized, funded clubs,” or “Affiliated, unfunded clubs,” under the “Clubs & Organizations,” section. There was dissent to this, and Business Administrator Martha McElligott explained that frequently changing the names create confusion. Also discussed in this section are club training requirements. Club and Organization Representative Justina Thompson voiced her opinions on this section, saying that there should be additional trainings, including those for unconscious bias. President of the Union Justin Etzine ’18 G’19 responded that the requirements, as they are, “scare off” officers. The policy limits registration of new clubs to the first seven weeks of the fall and spring semesters, and allows for a two month waiting period prior to coming before the Board for evaluation. After evaluation, a budget can be submitted for the following fiscal year. The “Budgeting & Finance” section specifies terms that prohibit clubs from creating a Venmo or PayPal account in the name of a club and clarifies that all cash donations must be processed by the Institute. This regulation is put in place to allow the IRS and the Institute to process information, and allow Rensselaer to take a 10 percent commission. The “Budgeting & Finance” also changed the subsidy for travel from “60 (individual) / 40 (Union) to 50/50,” as well as increased the hotel rate to “$175 (rural) and $225 (urban),” and banned “use of personal cars outside of Capital Region (30 miles from RPI).” Some expressed that this may limit club sports, and that the majority of students are not eligible for renting cars due to the required age being 21 years. Raab explained that exceptions can be made, but it was primarily for safety reasons. The conflict of interest policy, signage policy, and room reservation policies are now located in the “Facilities & Operations” section. A complete summary of the changes can be found online. A motion to “approve the Rensselaer Union Guidelines & Procedures, superseding all previously passed Board policies,” was passed 16-0-0. The clause removing a “$1,000 three quote requirement for motions before the board,” required a change to the Bylaws of the Executive Board, which was passed 16-0-0, awaiting confirmation by the Student Senate. The Black Students’ Alliance came before the board to reallocate $700 of their existing budget for “a new line item within the same program titled ‘Performers for the Fashion Show’ in order to pay for performers,” as well as a reallocation of $225 for “the creation of a fist design.” Member of the Black Students’ Alliance and Club and Organization Representative Charles Omoregbee ’21 explained the $700 was for five student performers, including himself and students from Rensselaer and the University of Albany. Several of the other performers did not request funds. He also explained that not all performers are getting equal compensation. Instead, compensation is based on “fan base” as well as how long they have been performing. Union Business Operations Committee Chairperson Brian Mansaku ’20 suggested making a new line item so they can spend it as needed. Etzine explained that money needs to be approved for specific items, to which Thompson questioned the specificity. Justin joked, “If they wanted to buy a flamethrower it would come back on us.” Club and Organization Representative Cody Kazakoff expressed that this seemed like a “back-route way of taking money from the Union,” and that approving this could allow for it to happen again in the future; he qualified his statement, saying he thinks the additions are good for the event. The motion to approve the reallocation of these funds to pay student performers passed 14-0-1. The fist design would be a handmade styrofoam piece hung in the entrance to the runway for the fashion show. The main concern held by the Board was safety as well as the storage space, to which the BSA presenters assured it would be secured and could be broken down for when they have storage space. The motion to reallocate $225 to pay for the creation of the fist design passed 13-0-2. RPI Ambulance came before the Executive Board to request “up to $1,700 from [Fiscal Year] 2019 Club Contingencies for the purchase of new station jackets for RPI Ambulance.” Senate-Executive Board Liaison and President of RPI Ambulance Mary Clare Crochiere ’19, Vice President of RPI Ambulance Ingrid Oprea ’21, and RPI Ambulance Captain Quazi Hossain, presented and explained the need. Of the six station jackets, the three most frequently worn sizes have been consistently having trouble with the zipper, as well as fading in color. The jackets help with professionalism, protect from bodily fluids of patients, and the proposed purchase meets the American National Standards Institute standards for high visibility uniforms for emergency workers. RPI Ambulance’s goal is to replace all six jackets over time. Union Club Operations Committee Chairperson Caitlin Kennedy ’20 suggested splitting the purchase over time, due to the large purchase that was recently approved. The motion was amended to read, “up to $1000.” The amendment passed 13-0-2, and the purchase was approved 12-1-0. Also, Yaseen Mahmoud ’22 was unanimously confirmed as Etzine’s appointment to the Executive Board, pending Senate confirmation. This leaves one voting spot on the Executive Board available. Etzine also made a motion to amend motion five from January 17, 2019 by “replacing ‘Union Reserves’ with ‘Facilities Reserves,’” due to a mistake in accounts for the hearthstone project.